There are many necessities that need to be improved in STEM (Science, Technology, Engineering and Math) education. The robotics represents a promising educational tool. Nowadays, robotic education tools arise with the aim of promoting the innovation and the motivation of the students during the learning process. Robots are becoming more common in our daily life; thus, it is important to integrate robots at all levels of our society. The robotics requires several skills such as systems thinking, programming mindset, active learning, mathematics, science, judgment and decision making, good communication, technology de-sign, complex problem solving and persistence. These skills can be easily developed using robotics educational tools. This paper presents the evolution from a simple remote 4-wheeled robot to a scaled platform currently under development. These developed platforms are intended to be used for educational purposes in the context of STEM education. STEM (Science, Technology, Engineering and Mathematics) education is a power-full tool which it is being more popular these days . Additionally, the robotics also provides an attractive manner to transform boring concepts into an amusing learning process. Robotic kits facilitate the ease with which students can make connections among STEM disciplines . Games and simple materials are a good combination with the aim of engaging students about computer science fundamentals. The article  describes a set of learning activities that were found suitable for non-formal learning environments. In , the authors present a programming education session through the production of the game program using Scratch as a programming environment and Nano board AG as a sensor board. The robotics is being used as the modernization and improvement for most of processes. This occurs as result of robots can be easily integrated within the current industrial processes . Furthermore, the robotics has become an important tool for the students to be involved in STEM. Nevertheless, the introduction to the robotics is not a simple task. First, the robotics combines mechanics, electricity, electronics, and computer science with the purpose of designing and building robotics applications. Robots are programmable electromechanical machines that include sensors to make decisions and adapt to different situations. Hence, a robotics educational platform promotes easily these skills. On the other hand, technologies are evolving day by day with an increasing speed. Now, the students must be familiar with the technology and the way to get knowledge about programming and use this kind of devices as they future professional career opportunities. Every day people is using Internet in order to connect to other people or with the aim of accessing a wide range of information and as well as sharing their ideas. According to , in the IoT (Internet of Things) sphere, Things can be identified and connected. After that, they will exchange information and they will make decisions by themselves. There are lots of IoT based applications which are being developed in many different fields. An example is  within the medical services field, where it is demonstrated how to collect, integrate, and interoperate IoT data flexibly to provide support to emergency medical services. Furthermore, in  the authors presented IoT applications in health care domain and connected car domain along with market segmentation. IoT is just a beginning in this digital era to make our life better. Authors are working on applying artificial intelligence techniques on IoT data for making predictions in the domain connected car and healthcare applications. Throughout the development of the master thesis , the development of a four-wheel robot was carried out to be controlled through the web. This construction includes DC (Direct Current) motors, lights and Wifi. The robot controller is an Arduino UNO board. The power supply used is a LiPo battery for the controller and the DC motors. Furthermore, other LiPo battery was used to power the WiFi camera. When having to drive four DC motors, an Arduino Shield has been used to control continuous motors stacked on top of the Arduino. Figure 1 shows an image of the 4-wheel robot. This robot is controlled using a web browser hosted on a PC (Personal Computer). A demonstration is provided in Youtube (https://youtu.be/oI64VkhQAfM). Figure 1: Remote 4-wheeled Arduino based robot. The state of the art of the robotics has contributions both by private companies and by individuals, as well as FPGA (Field Programmable Gate Array) based systems. In robotics, there are very different fields: industrial, healthcare, educational and even hobby. Data which is common in the FPGA-based systems, since in recent years more and more sectors including such devices in their products. To date, it is very often to find control systems based on microcontrollers because of its easy accessibility and its simplicity which does not require great knowledge. Meanwhile, the electronic design using FPGA requires knowledge about these devices, knowledge of languages used for programming and the use of specific tools developed by its manufacturers. Hence, throughout the development of the master thesis , the development of a control system based on FPGA which manages a humanoid robot with servos. This system exchanges information with a PC interface acting between the user and the control system. Bluetooth interface is used, contributing with more movement freedom because the robot is released of physical wired connections. A demonstration is provided in Youtube (https://youtu.be/QxWW5MXiIDI) (Figure 2). Figure 2: Remote humanoid robot based on FPGA. As evolution of the previous robotics platforms arises a new one with the aim of this platform is to provide a learning experience for users. This a learning experience goes beyond the acquisition of knowledge or specific skills, since it offers real opportunities thanks to freedom of reconfiguration, flexibility, versatility and scalability. It also enables the development of active learning methodological practices mainly focused on the user and in enhancing relations group. Users can set it so that individual learning spaces or group learning spaces are created. It also allows educators the option to create divergent, creative and open activities. The presented platform consists of a Main Module and four sub-modules. The Main Module is a hub which holds the four Secondary Modules. Main Module, apart from communicating with the Secondary Modules, can communicate via Bluetooth with Smart Devices physically separated from the platform. Furthermore, the Main Module is compatible with Arduino Shields. Secondary modules are compatible with Arduino Shields, whereby the latter can be assembled to the Secondary Modules with ease. External elements are devices that will interface between the platform and different types of electronic circuits or robotic platforms so they can be integrated into the system. Finally, thanks to the Bluetooth communication, the platform can access or be accessed via the Internet, using Smart Devices for this purpose. Figure 3 shows the collaborative robotic educational tool based on programmable logic and Arduino. Figure 3 includes a Main Module (green board) and two Secondary Modules (yellow boards) as an example. The collaborative robotic educational tool can consist of up to four Secondary Modules. Each of these modules is formed by other components with the aim of scaling the platform functionalities. In the example illustrated by Figure 3 it can be seen connected to the Main Module: a Bluetooth communications module and two Secondary Modules. Figure 3 also represents two Arduino Nano and an Arduino compatible Interconnections Shield. Figure 3: Remote collaborative robotic based on FPGA and Arduino. As favorable aspects, and after the experimental results obtained, it can be said that Bluetooth communications provide the system with freedom of movement, also allowing its location in the laboratory not to be subject to the length of the cables that connect the control system to the PC that acts as a remote laboratory server. Another aspect to be highlighted are the lessons learned throughout the execution of the work, having identified easy-to-use tools that allow to reduce development times compared to the others mentioned throughout the document . Simple and low-cost circuitry has also been achieved to adapt the voltage levels between the FPGA and the servos. Furthermore, this paper describes an open hardware platform that can be used in classrooms with aim of developing educational programs related to robotics in a collaborative environment which promotes innovation and motivation for students during the learning process. This platform emerges as a modular, reconfigurable, flexible, versatile and cost-effective. It can be easily adapted to the functionality needs with tight budgets. This tool is especially intended for educational institutions and centers which are interested in including it in their educational programs. The scope for the collaborative robotic educational tool based on Arduino programmable logic is STEM, scientific and technological development of educational projects that helps in teaching subjects related to Science, Technology, Engineering and Mathematics. Several work lines are being integrated in the educational robotic platform which promotes innovation and motivation for students during the learning process . The platform which is being developed presents wirelessly connections such as Bluetooth and WiFi as enhancements [11,12]. This research continues the development described in . Additionally, some educational robotic workshop such as  is being carried out to include the educational layer into the platform development. The doctoral thesis is being carried out in the Engineering Industrial School of UNED (Spanish University for Distance Education) and the Electrical and Computer Engineering Department (DIEEC). The authors acknowledge the support provided by the Engineering Industrial School of UNED, the Doctorate School of UNED, and the “Techno-Museum: Dis-covering the ICTs for Humanity” (IEEE Foundation Grant #2011-118LMF). And the partial support of the eMadrid project (Investigación y Desarrollo de Tecnologías Educativas en la Comunidad de Madrid) - S2013/ICE-2715, IoT4SMEs project (Internet of Things for European Small and Medium Enterprises), Erasmus+ Strategic Partnership nº 2016-1-IT01-KA202-005561), mEquity (Improving Higher Education Quality in Jordan using Mobile Technologies for Better Integration of Dis-advantaged Groups to Socio-economic Diversity), Erasmus+ Capacity Building in Higher Education 2015 nº 561727-EPP-1-2015-1-BG-EPPKA2-CBHE-JP, PILAR project (Platform Integration of Laboratories based on the Architecture of visiR), Erasmus+ Strategic Partnership nº 2016-1-ES01-KA203-025327, the GID2016-17 Remote Electronics Practices in the UNED, Europe and Latin America with Visir - PR-VISIR G-TAEI Research Group and the Research Project 2017 IEQ 17 Industrial Communications Networks. School of Industrialists UNED. Pickering TA, Yuen TT, Wang T (2016) STEM conversations in social media: Implications on STEM education. IEEE International Conference on Teaching, Assessment, and Learning for Engineering, Bangkok, pp. 296-302. Carro G, Carrasco R, Plaza P, Cañas MA, Sancristobal E, Castro M, Mur F (2015) Mechatronics and robotics as motivational tools in remote laboratories. IEEE Global Engineering Education Conference, Tallinn, pp. 118-123. Cápay M (2015) Engaging games with the computer science underlying concepts. International Conference on Interactive Collaborative Learning, Florence, pp. 975-979. Yoshihara K, Watanabe K (2016) Practice of Programming Education Using Scratch and NanoBoardAG for High School Students. 10th International Conference on Complex, Intelligent, and Software Intensive Systems, Fukuoka, pp. 567-568. Carro G, Martin S, Sancristobal E, Mur F, Castro M (2012) Robotics, the New Industrial Revolution. IEEE Technology and Society Magazine 31(2): 51-58. Lin Cui, Fung Po Tso, Di Yao, Weijia Jia (2012) WeFiLab: A Web-Based WiFi Laboratory Platform for Wireless Networking Education. IEEE Transactions on Learning Technologies 5(4): 291-303. Xu B, Xu LD, Cai H, Xie C, Hu J, et al. (2014) Ubiquitous Data Accessing Method in IoT-Based Information System for Emergency Medical Services. IEEE Transactions on Industrial Informatics 10(2): 1578-1586. Gupta N, Gupta J (2017) Internet of Things (IoT): A Vision of Any-Time Any-Place for Any-One. Int Rob Auto J 2(6): 1-6. 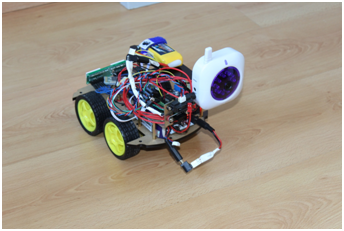 Plaza P, Castro M, Carro G (2013) Robotics based on FPGA for educational purposes (Unpublished master's thesis). UNED, Spain. Plaza P, Sancristobal E, Carro G, Castro M, Pérez C (2016) Collaborative robotic educational tool based on programmable logic and Arduino. Technologies Applied to Electronics Teaching, Seville, p. 1-8. Plaza P, Sancristobal E, Carro G, Castro M (2016) A Wireless robotic educational platform approach. 13th International Conference on Remote Engineering and Virtual Instrumentation (REV), Spain, pp. 145-152. Plaza P, Sancristobal E, Carro G, Castro M (2017) Wireless Development Boards to Connect the World. Online Engineering & Internet of Things 22: 19-27. Plaza P, Sancristobal E, Carro G, Castro M (2016) Robotic Educational Tool to engage students on Engineering. IEEE Frontiers in Education Conference, Eire, p. 1-4. Plaza P, Sancristobal E, Carro G, Castro M (2017) Home-made robotic education, a new way to explore, 2017 IEEE Global Engineering Education Conference (EDUCON), Athens, pp. 132-136.